This...is hard to believe! I'm dying to see the demographics on the percentage of US Mah Jongg players interested in purchasing Japanese sub-compact cars. I assume these are cash buyers, as nobody playing that game in the park appears to be employed. 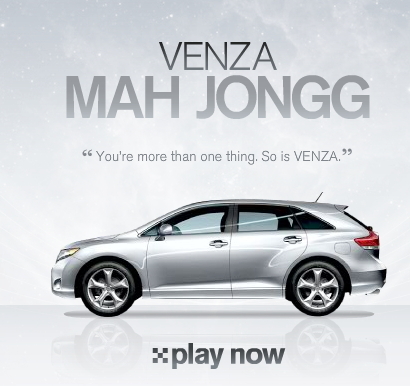 I didn't realize that the venza was targeting moms, but if they are Mahjongg is the #1 casual game for moms (a huge casual game market) online. And, candystand is the biggest casual games site on the web. I didn't realize wrigleys didn't own it anymore, so it actually makes perfect sense that Toyota would fish where the fish are -- assuming their target is moms.